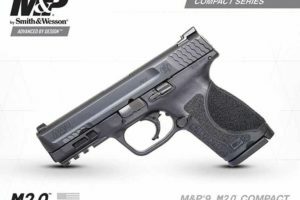 Smith & Wesson introduces the M&P M2.0 Compact with a 3.6″ barrel. 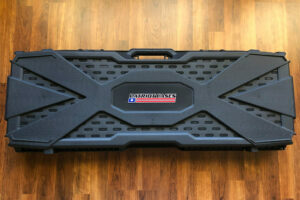 Having recently purchased one, you can read our review here. 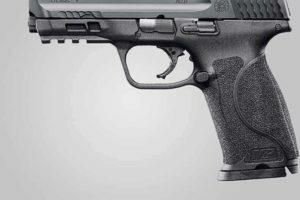 So, I just learned that the new Smith and Wesson M&P M2.0 Compact semi-auto pistol will soon be available at our local gun stores in both 9mm and .40 S&W. Length: 2.0 Compact is 7.3” vs 6.7” for Original Compact. 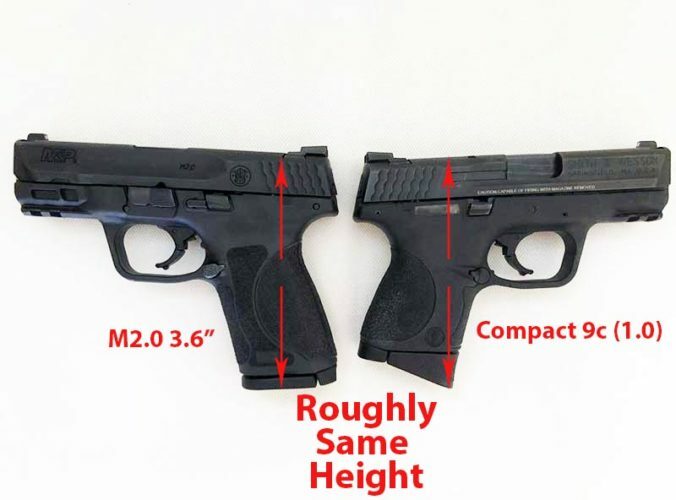 Height: 2.0 Compact is 5.0” vs 4.3” for Original Compact using the flat bottom magazine. However, if you use the original Compact’s magazine with the grip extension, the height of the original Compact becomes approximately the same (5.0″) as that of the Compact 2.0 when measured from the front bottom edge of the original Compact’s grip extension (see image below, although a 2.0 with 3.6″ barrel is pictured, it is the same height as the 2.0 with 4″ barrel). 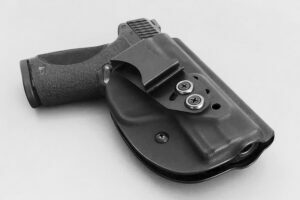 Barrel: 2.0 Compact is 4.0” vs 3.5” for Original Compact..
Capacity: The M2.0 Compact has a standard magazine capacity in 9mm of 15 rounds vs 12 rounds for Original Compact and in .40 S&W, 13 rounds vs. 10 rounds for Original Compact. Weight: 2.0 Compact is 24.0 oz vs 24.7 oz for Original Compact. Length: 2.0 Compact is 7.3″ vs 7.36″ for Glock 19. Height: 2.0 Compact is 5.0″ vs 4.99″ for Glock 19. Barrel: 2.0 Compact is 4” vs 4.01”for Glock 19. Capacity: Both pistols have the same standard magazine capacity. Weight: 2.0 Compact is 24 oz. vs 23.6 oz for Glock 19. How does the new 2.0 Compact compare to the new 2.0 full size with 4.25″ barrel? IMHO I would say that it is not much smaller. Barrel: 2.0 Compact is 4.0” vs 4.25” for Full Size. Capacity: In 9mm, 2.0 Compact is 15 rounds vs 17 rounds for Full Size; in .40 S&W, 13 rounds vs 15 rounds for Full Size. Weight: 2.0 Compact is 24.0 oz vs 24.7 oz for Full Size. The dimensions of the new M&P M2.0 Compact are virtually identical to those of the Glock 19. Suggested retail pricing is $569 which is the same as the 1.0 Compact and $30 less than the new 2.0 full size. I recently rented the M&P M2.0 Compact (9mm) from my local shooting range. By the way, earlier this year, I purchased the M&P M2.0 Full Size, 4.25″ barrel (review here) so I did not see the need to purchase the M2.0 Compact since there is little difference in size from my M2.0 Full Size. Reliability. The new 2.0 seems to be extremely reliable. After shooting 150 rounds of Magtech, 115 grain FMJ, I experienced no malfunctions of any kind. Trigger. Reset is audible and tactile. But, what I really like about the new M2.0 Compact is that the trigger pull is a little bit lighter than the older 1.0 models. 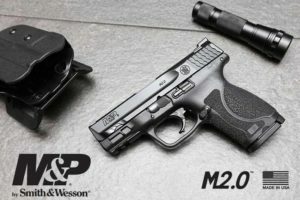 However, as I noted in my review of the M2.0 full size, I’m confident that in a high stress/adrenaline situation, no one will notice the difference in trigger pull weights between that of an older M&P and the M2.0, but at least on the range, I do prefer the feel of the lighter trigger pull. Grip Texture. I admit that I am not a fan of the new aggressive stippling. If I was to purchase this pistol, I would cover it with a rubber Talon Grip. Handling. The 2.0 uses the same optimum 18-degree grip angle as before, making the point of aim comfortable and natural. Accuracy. I find the 2.0 to be very accurate. Recoil. 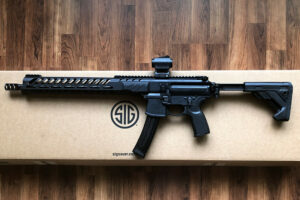 As you might expect, recoil is moderate and about the same as the full size 4.25″ barrel. 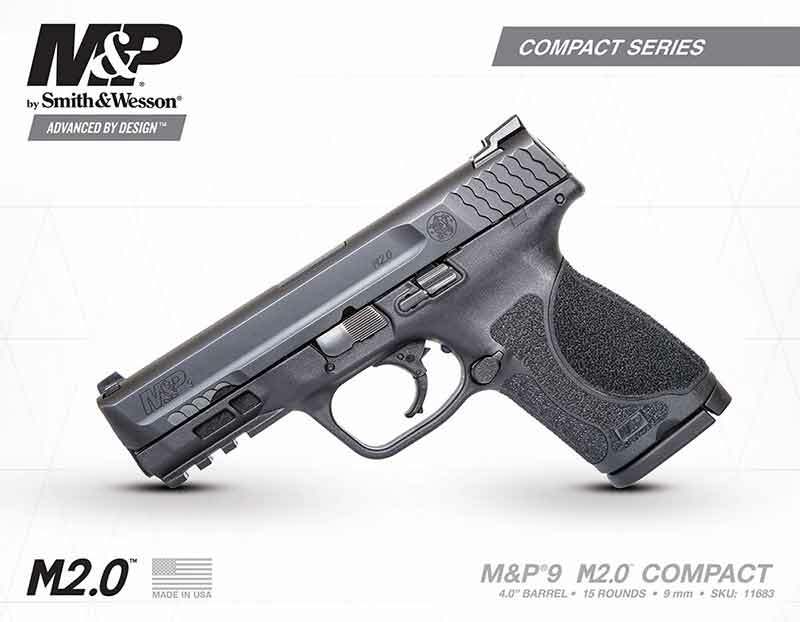 For more information about the M&P M2.0 Compact, visit the Smith & Wesson website here.